A spokesperson for Minister for Children Katherine Zappone said the minister will support the Government's "reasoned amendment" on The Protection of Life During Pregnancy (Amendment) Bill 2017. The AAA-People Before Profit's Private Members' Bill proposes to amend Section 22 of Protection of Life During Pregnancy Act 2013. Under Section 22, it is an offence to intentionally destroy unborn human life. A person who is guilty of this is liable to a fine or imprisonment not exceeding 14 years, or both. The AAA-PBP bill substitutes the 14-year sentence with a fine of not more than €1. Ms Zappone sought and received advice from the Attorney General on the issue. The advice was that the bill, if passed, would be subject to successful challenge on the basis of unconstitutionality. The minister's spokesperson said Ms Zappone supports the "reasoned amendment" by the Government. However, Ms Zappone "is not convinced by arguments that an abusive partner who causes a miscarriage intentionally would not - under the proposed bill - be liable to a higher sanction, as non-fatal offences such as assault would still apply". The bill was debated in the Dáil last night where Minister for Health Simon Harris said he could not support the bill and the Government would be tabling "a reasoned amendment" due to the fact that the Citizens' Assembly is currently carrying out its work in this area. It comes as thousands of people took part in marches through Dublin city centre over the Eighth Amendment. The Coalition to Repeal the Eighth Amendment held a March4Repeal to demand the Government names the date for a referendum on repealing the Eighth Amendment. 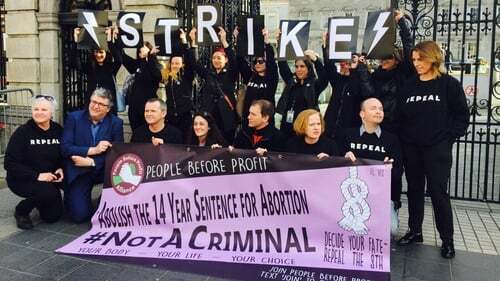 Elsewhere, the Strike4Repeal campaign encouraged women in Ireland to withdraw their labour on International Women's Day and called for an end to the 14-year prison sentence for women who procure abortions. Meanwhile, the Pro Life Campaign held an awareness event outside the Central Bank. Pro Life Campaign supporter Mary Kenny said: "There are many women who are very thankful that the Eighth Amendment was there and say that they owe the life of their child to this life-saving provision."